Singer, songwriter, bandleader, and blues guitar virtuoso, Matt Schofield “continues to push the frontiers and reshape the boundaries of the British Blues tradition.” Recognized three years in a row as British Blues Awards Guitarist of the Year, inducted into the British Blues Hall of Fame, and cited as one of only two living British artists to achieve the maximum four-star rating by the Penguin Book of Blues Recordings — Matt’s impact as one of the most distinctive guitarists of his generation is unquestionable. 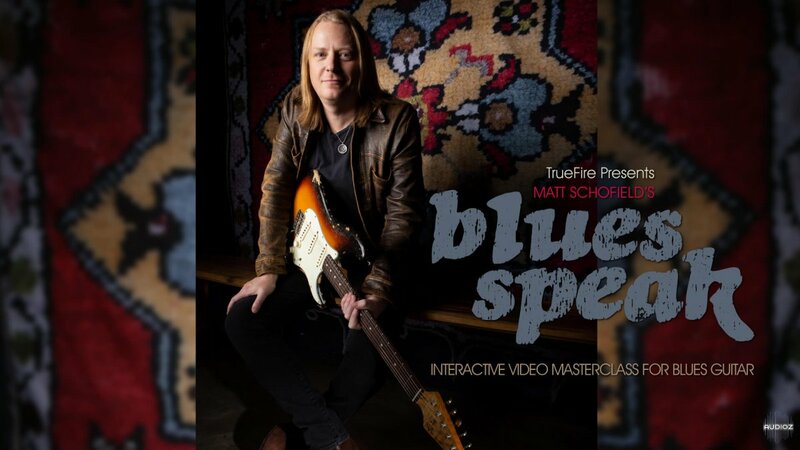 We’re thrilled to welcome Matt to the family with his first TrueFire course, BluesSpeak! You will likewise be thrilled when you grab your guitar and play your way through Matt’s extraordinarily illuminating electric blues guitar learning experience. ”Playing the blues is the ultimate form of expression for myself… and the guitar is the perfect vehicle for that expression. I use the term “blues speak” to describe how we communicate through the instrument to articulate our feelings, emotions, and tell our stories. Rhythm as a Springboard, Simple, Not Easy!, Death by Slow Blues Workout, Playing Across the Neck, How to Approach Blues Changes, More Outside Changes, Integrating Your Influences, Integrating Your Influences, Playful Phrasing, More Advanced Blues Harmony, Tone and Tone Production, and The Gear & The Hands. Matt will explain and demonstrate all of the key concepts and approaches along the way. You’ll get standard notation and tabs for the soloing performance studies and key demonstrations. Plus, Matt includes all of the backing tracks for you to work with on your own. In addition, you’ll be able to loop or slow down any of the videos so that you can work with the lessons at your own pace. Grab your guitar and let’s speak some blues with Matt Schofield! Thanks for your good work my friend !! Many thanks Sunny for the player !! !